Tony and Tom Bradman produced the immensely readable TITANIC, DEATH ON THE WATER earlier this year. Now Tony flies solo even further back in time to give us VIKING BOY, a thrilling saga that fuses testosterone-fuelled action with Norse myth. The Viking boy of the title is Gunnar, the only son and heir of a retired chieftain. The family lives peacefully on a fertile homestead, raising sheep and dining on hearty stew. This pastoral existence is cut brutally short when a rival farmer and his henchmen, known as the Wolf Men, attack the steading and burn down the family long house. 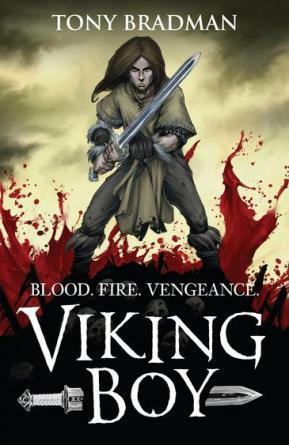 With his newly-widowed mother about to be forced into marriage by the enemy, Gunnard must journey to Valhalla, where he intends to barter with the gods and bring his father back to the world of the living. Bradman tells the story in brilliantly pared down language, letting the action speak for the characters. And there's plenty of action for the reader to enjoy: Viking raids; sword fights; a ride with the mythical Valyries, here depicted flying on winged beasts; a bravura kidnapping, a journey to Asgard, even an execution in a fast-flowing river. The final battle scene is epic and begs to be savoured more than once. But this isn't just an adventure yarn, it's also a brilliant coming-of-age story. Gunnar's character arc takes him from immature boy to a confident young man, aware of his place and role in society, ready to embrace the glory and responsibilities of his position. The boys I lent the book really identified with him, and begged to discover more about Norse myth. If this doesn't get reluctant readers reading, I don't know what will! Stirring stuff! Published by Walker Books. I interviewed Tony Bradman about his book on my blog. Read the post here. This sounds a great book to keep boys reading! we're reading it at school......................everyone is enjoying it even the teacher! a fab book - my class love it! Esp the boys!